Test Alliance Please Ignore [TEST] engaged and destroyed a Revenant-class supercarrier belonging to pilot Damien Shroud of Project.Mayhem. [16-13] on May 22, YC 118 in the Erila system on the edge of Caldari space. This marks only the sixth capsuleer-piloted Revenant destroyed in New Eden since the resurgence of Sansha’s Nation. 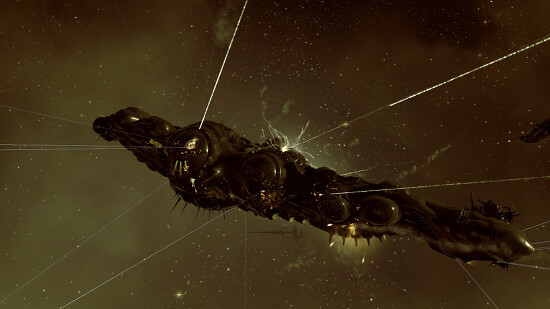 TEST joins Black Legion., Pandemic Legion, Goonswarm and Snuffed Out in the list of alliances who have successfully destroyed one of these elusive vessels. In a communication passed to Interstellar Correspondents, Damien Shroud said that he jumped his Revenant to kill a TEST Naglfar and commented that he wasn’t afraid to “drop shiny things to fights”. Unfortunately, he was caught by “at least 5 hics” shortly after landing in Erila. In a public post, TEST pilot and FC Vily elaborated on the operation, which was set up to hunt [16-13] ships in the Erila area after the destruction of a TEST dreadnaught. The Naglfar used as bait was almost lost to a [16-13] Phoenix and Archon before Damien’s Revenant jumped into system. The Naglfar lit a cyno and TEST reinforcements poured into Erila, destroying the Archon, Phoenix, and finally, the Revenant.